The Buccaneers have given up multiple passing TDs to QBs in eight of their 10 games this season, giving 49ers QB Nick Mullens an opportunity this week. Browns QB Baker Mayfield has thrown for nine TDs and just two INTs in his last four games and takes on the Bengals, who have given up the second most total TDs and the second-most fantasy points per game (FPPG) to the QB position. The Eagles may have been using a running back by committee approach this season, but Josh Adams’ snaps have been on the rise and he is averaging 7 yards per carry over his past three games. He takes on the Giants in Week 12, and they’ve given up the eighth most FPPG to RBs. Giants WR Sterling Shepard has averaged just over six catches and 84 receiving yards and has scored four TDs in five games against the Eagles in his young career. The Eagles pass defense has been decimated by injuries and has given up the second-most FPPG to WRs. With Buccaneers TE O.J. Howard being placed on injured reserve with an ankle injury, Cameron Brate should see an uptick in targets. QB Jameis Winston, who is starting for the Bucs again, likes to throw to his TEs. IS RAVENS RB GUS EDWARDS A VIABLE STARTER GOING FORWARD? We recommended Ravens RB Alex Collins as a sneaky play last week due to his favorable matchup against the Bengals. Well, we were partially right: The Bengals are bad at defending against the run, but it was Edwards (who?!) — not Collins — who took advantage of Cincinnati’s run defense. Collins hasn’t done much to convince the Ravens that he deserves to be their top RB this season. Edwards is an undrafted free agent who had an unremarkable college career at Miami and Rutgers, but he deserves more playing time than Collins for at least another week. Edwards faces the Raiders this week, and they’ve given up 11 total TDs to RBs this season. From there, his next three opponents are top 6 in FPPG to RBs. In addition, if the Ravens continue to start Lamar Jackson at QB, expect them to run the ball often, providing Edwards plenty of opportunities. Opportunity doesn’t always translate into fantasy production and we can’t guarantee that Edwards will rush for another 115 yards and score a TD in Week 12, but you can put him in your lineup this week based on his favorable matchup. Take it one game at a time for now. WHICH QB HAS MORE FANTASY VALUE ON A WEEK TO WEEK BASIS, BALTIMORE’S LAMAR JACKSON OR WASHINGTON’S COLT MCCOY? If the Ravens continue to start Jackson over Joe Flacco, he has more fantasy upside than McCoy. Jackson has a very favorable schedule going forward, with three of his next four opponents top five in FPPG allowed to QBs, and the other giving up the 12th-most FPPG to the position. Based on his first start, the Ravens may limit the amount of throws he makes until he grows into the job, but his ability to run (he has rushed for 117 yards) will likely provide a steady stream of fantasy points. McCoy may not be the worst backup QB, but a large chunk of his supporting cast (Jamison Crowder, Chris Thompson and Josh Doctson) have been dealing with injuries all season long. CAN TOM BRADY TURN HIS SEASON AROUND? Tom Brady is QB14 in terms of total fantasy points. That’s not what you expected when you drafted him this preseason, considering he was the overall QB2 last season. Although he’s 41 years old, you never should count Brady out. His peripheral stats are right about where they’ve always been and at 7-3, the Patriots are poised to win the AFC East again. The Pats don’t care about your fantasy team and never will. Brady has produced year after year and even weathered the storm when Julian Edelman, his favorite receiver, missed the 2017 season due to injury. It’s been a different kind of year for Brady. When Sony Michel was healthy, New England was running the ball a lot more. That hurt Brady’s fantasy stats. Perhaps the drop in Brady’s fantasy production is directly tied to TE Rob Gronkowski’s injury woes. The Pats are still winning and if Gronkowski can come back healthy after the bye, there’s a good chance we’ll see the Brady refocus, as he always seems to do when the stretch toward playoffs comes around. D.J. MOORE, TRE’QUAN SMITH AND CHRISTIAN KIRK HAVE ALL BEEN COMING ON AS OF LATE. 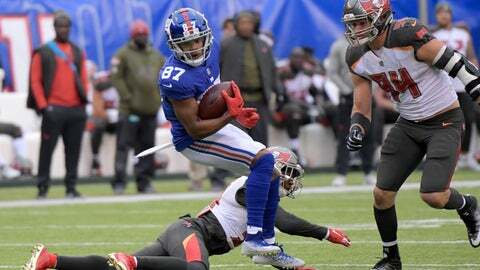 WHICH ROOKIE WR CAN YOU TRUST AT THIS CRUCIAL PART OF THE FANTASY FOOTBALL SEASON? All three rookie wideouts have a great deal of upside and are getting better as the season progresses. Although it’s tough to like much about the Cardinals after they lost to the Raiders in Week 11, Christian Kirk has been the most consistent WR of the rookie trio. He’s averaged six targets and just over 52 receiving yards over his past five games. Smith’s season has been all over the place. He’s had monster games and games where he wasn’t even targeted. Moore has also been inconsistent.